Your item(s) has been added to your cart! You'll be able to schedule installation and choose from product add-ons when you check out. It looks like you already have an appointment with us. You can edit your previous appointments or you can create a new one! Our driver will come to your office, home, or school, pick up your vehicle to service it, and have it back to you, all within your timeframe. Pickup and Delivery, only $25 roundtrip. You can bring your vehicle into our store where our knowledegable and friendly staff will take care of you and your vehicle. "Hey there, lets start by getting your vehicle or tire size." Locate the sidewall of your tire. How long a tire lasts before wearing out its tread is an important element to ensure you are getting the best value for money. There can be huge differences in the tire mileage you will receive based on the tire's design and quality of the tire. High performance tires tend to have lower tread life than standard passenger car tires because the focus of the design is grip and performance instead of longevity. Silica, tread design, and tread compound are attributes that contribute to tire longevity. Tires can have a big impact on your vehicle’s fuel consumption. Buying fuel ecient tires that or low rolling resistance can help you save on fuel – another way to give you a good value for money. These tires have speciﬁc attributes such as tread compounds and rolling resistance to reduce friction with the road. Your ability to brake, to turn, to accelerate or to stay stable at higher speeds all depend on your tire’s grip. Each type of tire is designed to provide grip in speciﬁc types of weather and road conditions. Siping and circumferential grooves are some of the attributes that contribute to tire grip. Handling is how your vehicle responds to the demands of the driver such as steering, accelerating, braking and to road conditions. Great handling tires can enhance safety - by keeping the vehicle stable and the driver in control - as well as driving pleasure. Silica, tread compound, and sidewall durability are attributes that contribute to a tires handling. 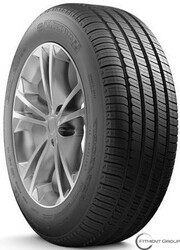 Driving comfort refers to how the tire cushions the driver from the irregularities of the road. Tires that are optimized for better comfort have specially designed construction to help absorb bumps and provide a smooth ride. Tread design and structure are attributes that can contribute to a quiet ride. You will be added to our promotion and savings blast!